The Massageteans or Massagetaeans were an Iranian nomadic confederation in antiquity known primarily from the writings of Herodotus. Their name was probably akin to Getae and Thyssagetae. [1.215] In their dress and mode of living the Massagetae resemble the Scythians. They fight both on horseback and on foot, neither method is strange to them: they use bows and lances, but their favourite weapon is the battle-axe. Their arms are all either of gold or brass. For their spear-points, and arrow-heads, and for their battle-axes, they make use of brass; for head-gear, belts, and girdles, of gold. So too with the caparison of their horses, they give them breastplates of brass, but employ gold about the reins, the bit, and the cheek-plates. They use neither iron nor silver, having none in their country; but they have brass and gold in abundance. 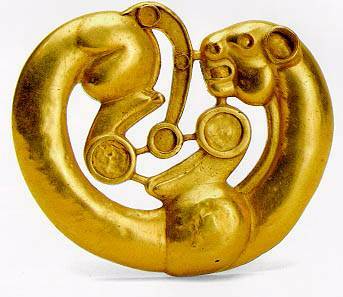 [1.216] They were similar to the Scythians in their dress and mode of living. The only god they worship is the sun, and to him they offer the horse in sacrifice; under the notion of giving to the swiftest of the gods the swiftest of all mortal creatures. [1.201] When Cyrus had achieved the conquest of the Babylonians, he conceived the desire of bringing the Massagetae under his dominion. Now the Massagetae are said to be a great and warlike nation, dwelling eastward, toward the rising of the sun, beyond the river Araxes, and opposite the Issedonians. By many they are regarded as a Scythian race. According to Herodotus, Cyrus the Great of Persia met his death in a battle with the Massagetae living beyond the Araxes river. They were a people from the southern deserts of Khwarezm in today''s Bukhara, Uzbekistan. The queen of the Massagetae, Tomyris, prevailed, although Cyrus had defeated Tomyris''s son Spargapises. Herodotus mentions: Of all the combats in which the barbarians have engaged among themselves, I reckon this to have been the fiercest. Ammianus Marcellinus considered the Alans to be the former Massagetae. At the close of the 4th century CE, Claudian (the court poet of Emperor Honorius and Stilicho) wrote of Alans and Massagetae in the same breath: "the Massagetes who cruelly wound their horses that they may drink their blood, the Alans who break the ice and drink the waters of Maeotis'' lake" (In Rufinem). 1. Christian, David (1998). A History of Russia, Central Asia, and Mongolia. Malden, Massachusetts: Blackwell Publishing. ISBN 0-631-20814-3. 2. Engels, Donald W. (1978). Alexander the Great and the Logistics of the Macedonian Army. California: University of California Press. ISBN 0-520-04272-7. 3. Karasulas, Antony. Mounted Archers Of The Steppe 600 BC-AD 1300 (Elite). Osprey Publishing, 2004, ISBN 184176809, p. 7. 4. Wilcox, Peter. Rome''''s Enemies: Parthians and Sassanids. Osprey Publishing, 1986, ISBN 0850456886, p. 9. 5.Gershevitch, Ilya. The Cambridge History of Iran (Volume II). Cambridge University Press, 1985, ISBN 0521200911, p. 48. 6. Grousset;. The Empire of the Steppes. Rutgers University Press, 1989, ISBN 0813513049, p. 547. 7. Wheeler James T., The Geography of Herodotus ...: Illustrated from Modern Researches and Discoveries. London, Longman, Brown, Green, and Longmans, 1854, LCCN 05006215 p.192. 8. Ammianus Marcellinus: "iuxtaque Massagetae Halani et Sargetae"; "per Albanos et Massagetas, quos Alanos nunc appellamus"; "Halanos pervenit, veteres Massagetas".